One of the world most successful investment banker one said that "if you are getting 1 rupee coin at 50 praise or 60 praise you must buy it ". This way you can save money or earn profit. The latest order of supreme court giving you the same opportunity where you can get upto Rs.22,000 discount on Scooters and bikes of BS-III models. Supreme Court decision of yesterday restricting offer of old and Polluted Bharat Stage III (BS-III) vehicles become the landmark of frenzy discounts on bikes, three-wheeler s, trucks and buses. 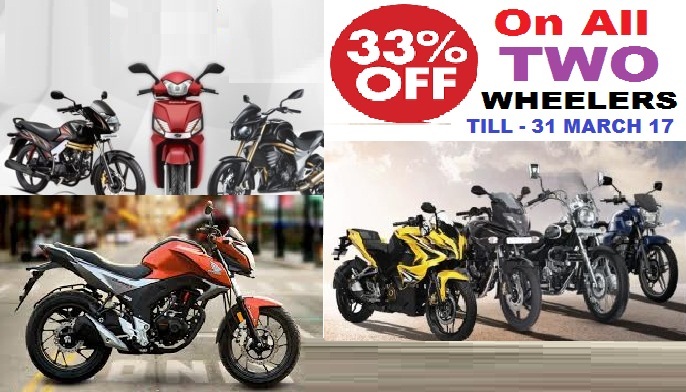 Frantic Two Wheeler dealers are giving without end three to four overlay higher discount contrasted with ordinary conditions as there is excitement to sell the BS-III stock which will end up plainly outdated after April 1. Honda Motorcycle and Scooter India (HMSI) is offering cash back offer of Rs 18,500 - Rs 22,000 on its BS-III scooters and motorcycles models. BOGO Buy One Get One Free Some dealers are gifting Navi absolutely free with either of the CBRs (when bought at the actual price). CD 110DX (Rs 47,202 to Rs 47,494). Hero MotoCorp offering discounts of up to Rs 12,500 on its BS-III two-wheelers. Rs 5,000 on entry level mass market motorcycles. Gixxer (Rs 77,452 to Rs 90,421) - Rs 5,000 discount with exchange benefits of up to Rs 2,000.